The Presidential state car is a hot subject among many, but how much do we know about the world’s most heavily armored presidential limousine? Not much I would say, after all, the Limo One’s specs are classified for security reasons. 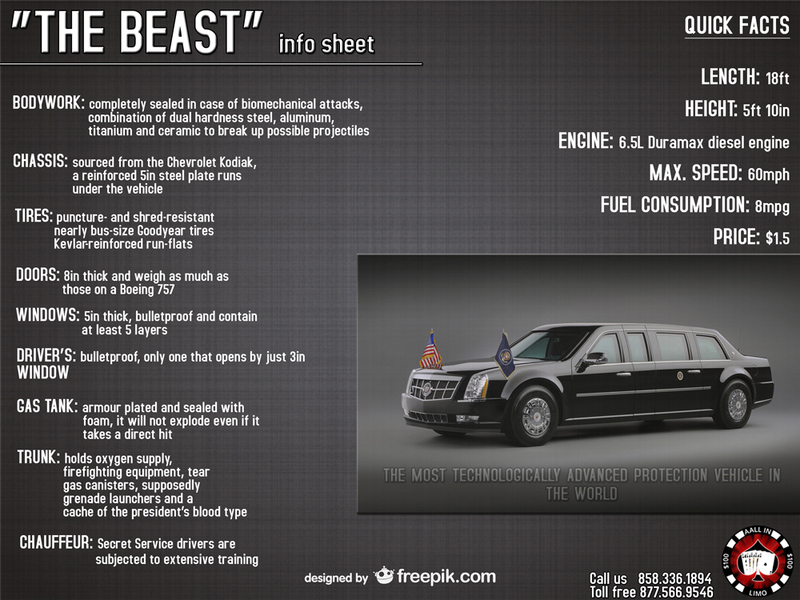 The Secret Service refers to the heavily armored limo as The Beast, a name which fits this specially commissioned vehicle like a glove. President William McKinley was the first president to ride in an automobile, but the first government-owned automobile, a white Stanley Steamer, was used during the presidency of Theodore Roosevelt. President Woodrow Wilson was one of the first chief executives to ride in a Cadillac during a World War I victory parade in Boston. In 1938, 2 Cadillac convertibles dubbed Queen Mary and Queen Elizabeth were both delivered to the US government, serving Roosevelt, Truman, and Eisenhower. The Sunshine Special, used by Roosevelt, was the first car specially built for presidential use in 1939 and was a Lincoln V12 convertible. Since 1939, the Lincoln limousines were chosen as presidential vehicles up until 1983, when Ronald Reagan used a Cadillac Fleetwood Brougham. In 1989, George H.W. Bush was riding in a Lincoln Town Car, but since then, the age of Lincolns used for presidential purposes ended. Bill Clinton used a Cadillac Fleetwood in 1993, which was the first Caddy designed from the ground up for use as a state car. The limo is now on display at the Clinton Presidential Library. 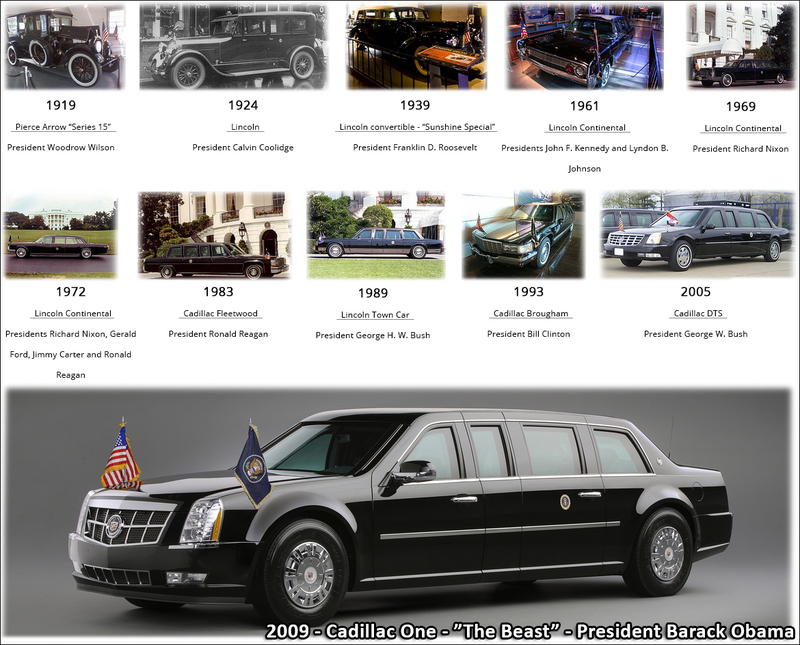 During George W. Bush’s presidential terms, the Cadillac DTS was the presidential limousine until 2009, when the current presidential limo entered service on January 20. Manufactured by General Motors, the 2009 limo is based on the Cadillac DTS, but it is the first not to carry a specific model name. Impressive from top to bottom, The Beast shares little in common with a standard production car. Although the outward appearance carries many current Cadillac styling themes, the body itself seems to be a modification of the immediately previous DTS-badged Presidential limos. However, the chassis and driveline are sourced from the Chevrolet Kodiak commercial truck and many body components are sourced from a variety of Caddies: the headlights, side mirrors, and door handles are borrowed from the Escalade, and the taillights and back up lights seem to be from the STS sedan. Although many of the vehicles’ security enhancements cannot be discussed, it is safe to say that this car’s security and coded communications systems make it the most technologically advanced protection vehicle in the world. No price tag has been announced, but it is assumed that each limousine costs around $1.5 million. Each limousine? YES. There is not just one Beast roaming the streets, but a few of them. The other limos are used for high-ranking foreign officials and VIP guests when they are visiting Washington, D.C., but nobody knows why the Secret Service rotates between presidential vehicles. Also, it is not known whether they are all functionally identical. Some do look more like a DTS than The Beast. In addition, the president sometimes travels in a heavily-armored Chevrolet Suburban or a modified Prevost bus known as Ground Force One. Calling this limo armored is an understatement… and that is because probably there is not a better-armored vehicle with windows on the planet than The Beast. The armor plating on it is allegedly 8 inches thick and the doors weigh as much as those on a Boeing 757. The windows are also very impressive: they are 5 inches thick, bulletproof and contain at least 5 layers to put a damper on any effort by subversives. You can only imagine just how heavy this vehicle is! Judging by its rumored weight of 20,000 lbs., The Beast needed proper tires and a good enough engine for lugging all that weight around. The puncture- and shred-resistant and nearly bus-size Goodyear tires are Kevlar-reinforced run-flats capable of keeping the limo on the road for a good distance if needed. The steel wheels can keep rolling even if the tires do get punctured. On to the second fact, the equipment carried by The Beast is something out of a James Bond movie. Pop open the trunk and you will find anything from firefighting equipment, oxygen tanks, tear gas canisters to shotguns, supposedly grenade launchers and even a cache of the president’s blood type! The vehicle can hold 7 passengers. At the very least, it has 3 passengers aboard: the driver, the president’s lead Secret Service protective agent in the front passenger seat, and of course the president himself. 4 additional seats in the back are available, 3 of them being rearward-facing spots on a bench and one spot next to the president. There is a folding desk separating the president from his guest’s spot. The president’s bench is covered in a dark blue cloth, rather than leather, but the vehicle has plenty hidden on board. Shoulder belts buckle into the outboard corners and retract toward the center of the bench. The driver is not your average one. Only highly-trained drivers are used, which can execute police-style evasion techniques if needed. 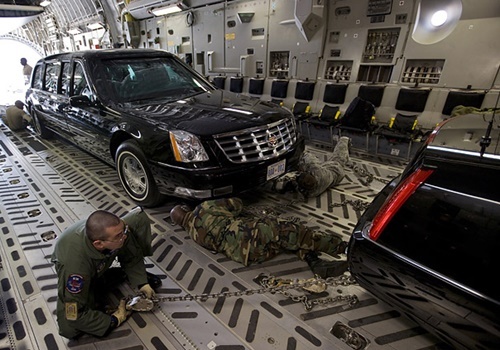 Each Secret Service driver is subjected to extensive training on a secluded site, which is believed to be a military base, with input from GM engineers and test drivers. For a Presidential Feeling, Choose Aall In Limo & Party Bus! Although we may not be driving around in armored limos, we can get you and your friends safely to and from any event in San Diego and Temecula. From San Diego brewery tours, Temecula wine tasting, to business/corporate meetings and other formal events, we provide our clients with VIP services. Whether you need transportation services for one, or for a large group of board members, special guests, seminar attendees, visitors, or any other large group, we can accommodate your needs. To book a limousine or a party bus, please call us today at 858.336.1894.